Original (original) Previous Year (old) Solved Question Paper of DBT BET JRF 2019 Examination (Department of Biotechnology- Biotechnology Eligibility Test – Junior Research Fellowship) with Answer Key and Explanations as PDF. DBT BET JRF aspirants can download the question paper as single PDF file for your exam preparation. Please feel free to inform the Admin if you find any mistakes in the answer key provided. 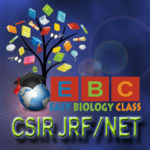 Official / Original Previous Year (Old) Solved Question Paper of CSIR Junior Research Fellowship (JRF) and National Eligibility Test (NET) Life Sciences (XL) Examination December 2018 with Answer Key as PDF. CSIR aspirants can download the question paper as single PDF file for your exam preparation. To download the question paper, please click on the download link below the PDF preview. Please inform the Admin if you find any mistake in the answer key.